From an acclaimed author and a New York Times Best Illustrated artist comes the fascinating, little-known—and true!—story of New York City’s first subway. 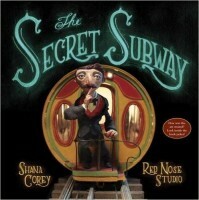 Shana Corey has written several picture books, among them Here Come the Girl Scouts!, a New York Times Editors’ Choice, and You Forgot Your Skirt, Amelia Bloomer, which the New York Times called “a picture book girls are likely to love.” She has always been intrigued by New York City history, so when she came across a passing mention of Alfred Ely Beach’s underground train, she wanted to know more. It wasn’t long before she was skulking around Warren and Murray Streets, looking for the site of Devlin’s department store, and seeking out Boss Tweed’s grave in Greenwood Cemetery. Learn more at shanacorey.com. Red Nose Studio created the art for Here Comes the Garbage Barge! by Jonah Winter, which was selected as a New York Times Best Illustrated Book, a School Library Journal Best Book, and a Huffington Post Best Picture Book of the Year and received four starred reviews, as well as The Beginner’s Guide to Running Away from Home by Jennifer LaRue Huget, praised by the Wall Street Journal for its “vivid and arresting illustrations.” Visit him at rednosestudio.com.